I'm so excited about what I have to show you this week, friends! Lots of vintagey dresses, plus Fluevogs! And although I didn't take pictures, we seem to have alot of Simons in the shop right, so, if that's your thing, come by to check it out! This dress in real life is exactly like how you are imagining it: stretchy silky fabric, flattering rusching at the waist and a bow at the neck. Super retro but not at all costumey! This gorgeous, understated Coach purse and wallet set has gotten so much attention in the shop! The colour is fuschia (is that coming through on your screen? You'll have to trust me! ), with gold hardware...simple and classic! The Fellowship family is my favourite of the Fluevog families! OK, this brand also has a cool name: Shabby Apple! (Love it!). I love the white-on-blue stripes here; they really nailed that vintage, house-dress type of blue! I love the shape of this dress, and the tie around the waist at the back is super wide and keeps the whole look looking grown-up! This is such a great top from Oak and Fort! I find it a bit more playful than their other stuff, while still maintaining that minimalist feel that we love them for. 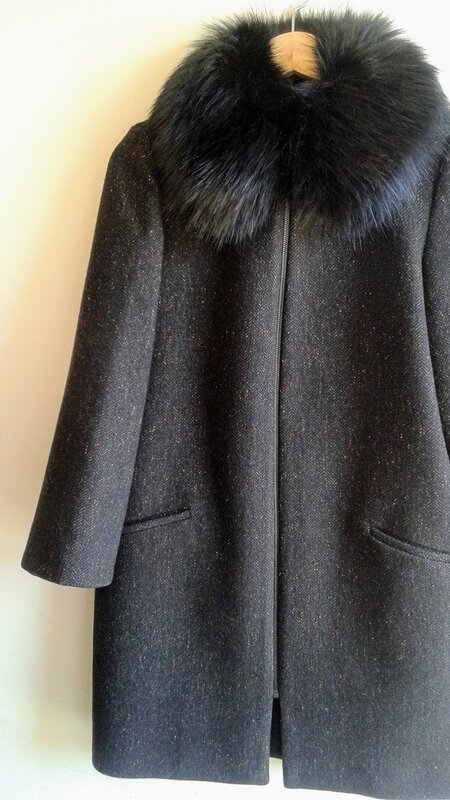 Can anyone really resist a cocoon coat with a dramatic furry collar?! Ooooooo, friends, check out the teeny-tiny miniature elephant pendant!! Yes, more Fluevogs! These boots go back to around the early aughts and are named Andante from the Minstrel family. They feature the classic 2 inch rubber "Minstrel heel", lovely brown pebbled leather with, once again, mustard yellow contrasting! "HEY MINSTREL! Your Love Makes Me Sing! Arise! Come! My Darling My Beautiful One, Come With Me." A seriously grown-up jean jacket from Madewell. This one has leather sleeves and collar! We have been running out of hangers to put out more pants from the back room, so to free up some hangers we are having a crazy pants pants sale this week! And from my own Fluevog archives, here is my Fellowship collection (because everyone needs three pairs of boots that look exactly alike, right?! ).